"The fossil cells are preserved with incredible detail – right down to the level of nanoscale keratin fibrils. 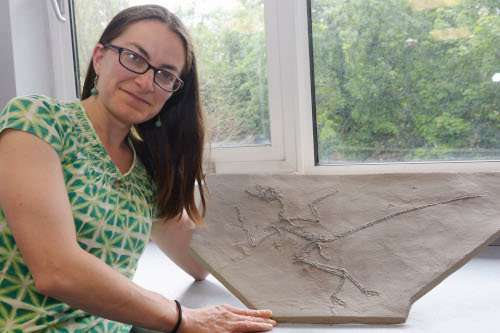 What's remarkable is that the fossil dandruff is almost identical to that in modern birds – even the spiral twisting of individual fibres is still visible," said Dr Maria McNamara. The study suggests that this modern skin feature evolved sometime in the late Middle Jurassic, around the same time as a host of other skin features evolved. "There was a burst of evolution of feathered dinosaurs and birds at this time, and it's exciting to see evidence that the skin of early birds and dinosaurs was evolving rapidly in response to bearing feathers," Dr McNamara added. Co-author Professor Mike Benton, from the University of Bristol's School of Earth Sciences, said: "It's unusual to be able to study the skin of a dinosaur, and the fact this is dandruff proves the dinosaur was not shedding its whole skin like a modern lizard or snake but losing skin fragments from between its feathers." Modern birds have very fatty corneocytes with loosely packed keratin, which allows them to cool down quickly when they are flying for extended periods. The corneocytes in the fossil dinosaurs and birds, however, were packed with keratin, suggesting that the fossils didn't get as warm as modern birds, presumably because they couldn't fly at all or for as long periods.